EFNEP is a free program offered in 20 Ohio counties. The adult program serves low income adults with children in the household. 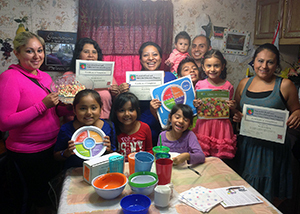 EFNEP teaches caregivers how to make healthier, safer, and lower-cost food choices for themselves and their families while boosting their ability to choose and buy food that is healthier for their families. They also gain new skills in food preparation, storage, and safety, learn how to better manage their food budgets, and how to increase their physical activity levels. Ohio EFNEP also provides specialized education to pregnant and new mothers as well as nutrition workshops which take into account healthy parenting styles and techniques. The adult program is a series of six to eight group meetings headed by an EFNEP Program Assistant over the course of one or two months in the county where the participants live. The meetings take place at various locations throughout the counties, often in partnership with local and state agencies. Adult participants are asked to complete an enrollment form, short survey, and a 24 hour food recall at the first and last lesson. A Diet Summary report is provided to participants to help them gain insight into their daily eating habits and the nutritional breakdown of their meals. Ohio EFNEP strives to provide the most up to date, evidenced-based knowledge in their practice and teaching. The adult curriculum, Eating Smart • Being Active is an evidence based, nutrition education and obesity prevention curriculum based on the socio-ecological model.